Adorned vs. a Doormat: When does being a ride-or-die girlfriend STOP making sense? In the case of Kimbella Vanderhee and Juelz Santana, the jury is still out. This weekend all the urban blogs were abuzz about the news that Dipset rapper Juelz Santana had finally proposed to his “ride-or-die,” long-suffering girlfriend Kimbella Vanderhee in front of crowd at the Apollo Theater. Usually when the news of a celebrity proposal hits the internet people are excited and post hyperbolic well wishes congratulating the happy couple with declarations of “relationship goals” and the obligatory #BlackLove hashtag thrown in for good measure. Except, this time around, that definitely wasn’t the case. Instead, thousands of their social media followers, particularly Black women, sat up with the quickness to send Vanderhee messages of concern and critique; begging her to reconsider Santana’s proposal and warning her this was just an attempt to trap her into staying with him during his legal troubles. “Juelz Santana finally popped the question to kimbella after being together over a DECADE. B***h naw can’t be me,” posted one follower. This sentiment was echoed all weekend, as many noted the suspicious timing of the rapper and Love & Hop Hop New York star getting down on bended knee just a few weeks before his December 12th sentencing that could have him facing up to 20 years in jail. For three days straight the concept of #BlackLove seemed to be under attack as Black media and fans alike penned long think pieces about our need to let go of the “ride-or-die chick” archetype. For the most part, they all made some riveting arguments. On Tuesday, singer Miguel, and his love of 13 years announced that they had finally got married and suddenly everyone started believing in love again. They were showered with an outpouring of support and well wishes. 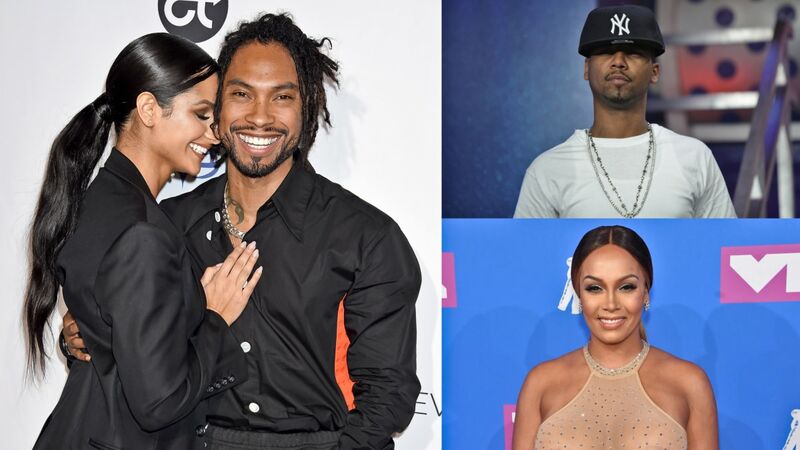 Which got me thinking, Miguel made his woman wait 12 years to pop the question – almost 3 years longer than Juelz Santana made Kimbella wait – so why does this feel so different? Why are we clapping for one couple, while publicly flogging the other? Didn’t they essentially do the same thing? The answer in a nutshell is no. No, they didn’t. The difference between these two situations is a perfect example of when being “ride or die” is a romantic show of loyalty versus being the kind of “ride or die” who is in a toxic display of low self-esteem exacerbated by an inability to simply admit you put all your eggs in the wrong basket. Back in 2015, Miguel’s career was hitting it’s stride and because he seemed to be on top of the world, he was constantly asked why he still hadn’t proposed to his then-girlfriend of 10 years, Nazanin Mandi. At the time many people questioned his assertion that his girlfriend knew he was, “wild at heart,” and not settled enough to be a good husband. Time has shown that he really did spend all those years working on himself. As a result his self-esteem, overall demeanor and confidence visibly grew by leaps and bounds. When Miguel and Nazanin decided to wait, it was based on the intention to “do it right or not at all.” They even broke up a few times to give each other space to figure things out. The only time being a ride-or-die partner makes sense is if you use part of that time to develop into a better version of yourself. Miguel in 2018 is a much better man than Miguel in 2015. Which arguably speaking means Nazanin made a good investment. On the complete other end of that spectrum are Juelz Santana and his long-suffering (but willing) captive, Kimbella. While Miguel was telling the world he wanted to be a good man for his woman before asking her to give him “forever,” Juelz Santana was cheating on Kimbella with multiple women and then beating the breaks off of her when he found out about the time she retaliated and acted in the same manner. While Miguel was taking a back seat and letting Nazanin shine in her VH1 show, The Platinum Life (only making appearances to tell the viewing audience what an amazing talent she was in her own right) Juelz was standing in front of a green screen, for the same network, admitting that he treated his “baby mama” like trash and basically hoped she hated herself enough to keep putting up with it. I am usually not a fan of comparing people’s relationships, but the lesson that these two seemingly similar, but incredibly different situations goes to show is: not all “ride-or-die” situations are created equal. And, there’s a huge distinction between growing with someone versus being used as a longterm crutch. Nazanin was ‘Adorned’ and Kimbella was essentially treated like a door mat. As such, it would make sense that we’d all find it difficult to clap for them in the same way. Before anyone starts getting lazy and calling me a man hater, let me just say that yes, I recognize we can’t just blame the guys for all of this. All relationships are co-created and therefore the women have some accountability too in these situations. To that point, it’s worth noting that the rules you set up with someone up front goes a long way in determining what type of relationship you’ll likely find yourself in. Nazanin was following her passions when she met Miguel. She was interviewing him about his music for a TV segment and very playfully slipped in a question about his relationship status. He said he was single and their relationship started from there. They met as equals with similar interests. Kimbella on the other hand, reportedly met Juelz while doing urban modeling and other Video Vixen type work. There’s nothing wrong with a woman taking ownership of her sexuality, but when he laid eyes on her, it’s clear he first viewed her as just arm candy; the trophy who should feel lucky he even gave her the time of day.This disparity in their power dynamic still plays out to this day, two kids and nine years later, even as she defends him to the public and advises other women to follow in her foot steps. No one can walk all over you unless you lay down and play dead first. Kimbella will at some point have a “come clean” moment with herself where she acknowledges all the places where she gave up her power to a man who has noticeably decreased in value over the years. Juelz Santana in 2018, is only a shell of the man he was five or even 10 years ago. Unlike Miguel, he was NOT a good investment, but at this point his fiance seems too prideful to admit that and cut her losses. We also have to admit that a lot of our girls are socialized to think like Kimbella and believe that their value as a woman is directly proportionate to how much abuse they can tolerate until their beloved finally sees the light and realizes they were there all along, faithfully waiting by their side. Personally, I believe that the only thing that needs to be faithfully waiting by anyone’s side is a dog. Love may be unconditional, but well functioning relationships are supposed to have boundaries and ground rules based on mutual respect. This idea that someone has to stick by you even when you’re acting like a complete donkey is hot garbage rhetoric passed on to us by our forefathers and it’s time we rebuke it. Sure, back during slavery, Black families were torn apart leaving women to hold down the home as a necessity while their men went out into the cruel world to face white supremacy head on. Even in the 1950’s and 60’s many households were single income, and misogyny was not just a mentality, but also the law of the land. Women were often stuck in relationships well past their expiration date as a matter of survival because they weren’t even allowed to get the kind of jobs they would need to adequately take care of themselves or their children without a man’s assistance. I understand all the reasons why our grandmothers felt they had to stay, and I would never dare judge them for it. But it’s 2018 fam. Women now have options. We have opportunities. And most of all, we finally have a voice. At what point are we gonna start using those voices to rewrite these antiquated notion of “stand by your man – at all costs,” that’s been passed down like a cracked piece of china that needs to be donated to the Good Will? And this isn’t a rhetorical question either, because while everyone is worried about Kimbella, I’m a lot more concerned about her daughter Bella Monroe James who is already getting a well televised education on how to be mistreated by a man in the name of love. We seriously gotta do better ladies, if not for ourselves, then for our children. They’re watching, and taking notes.